This unique 2-in-1 formula with the scarlet hue imparts a healthy flush for the blushing bride. It is enriched with a color sealer and a high level of stain, lasting all day long, despite all the eating, drinking and kissing you do on your wedding day! These two cherry-pink shades are moist and shiny, infused with smooth gold light refracting shimmer for fuller looking lips. They can be applied on the lips over the Lip & Cheek Stain, adding shine and shimmer to that all-day staying power, or worn alone as a sheer, shimmering color wash. The perfect, soft bridal shades! These versatile pencils were designed to provide subtle definition to the lips and create a water-resistant barrier which extends the wear of wedding day lip color (or any other day!). Their unique texture allows for smooth application, easy blending and long wear. A fresh face for the "do it yourself" bride. You can't go wrong with these shades for your big day! 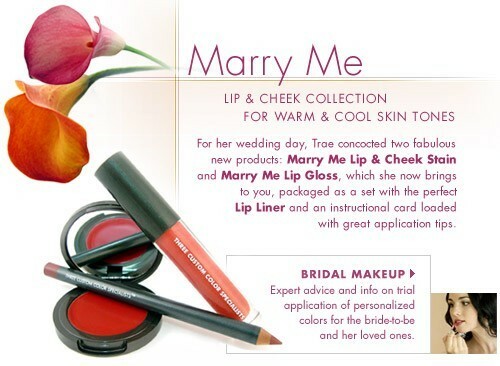 Designed for Cool skin tones, this rosey shade is perfect for the modern, sophisticated, yet blushing bride. The Stain pigments are a great base shade for lips and will last through all the kisses and sips of champagne! Designed for Warm Skin tones, this rosey shade with a hint of apricot is perfect for the modern, sophisticated, yet blushing bride. The Stain pigments are a great base shade for lips and will last through all the kisses and sips of champagne!